The BCITS Simon Cox Student Design Competition is our signature event and an opportunity for us to honor the life-long work of our previous ED, Simon Cox. Helping people was Simon’s passion, he enjoyed seeing young minds at work, finding solutions to challenges to improve the lives of the clients we serve. 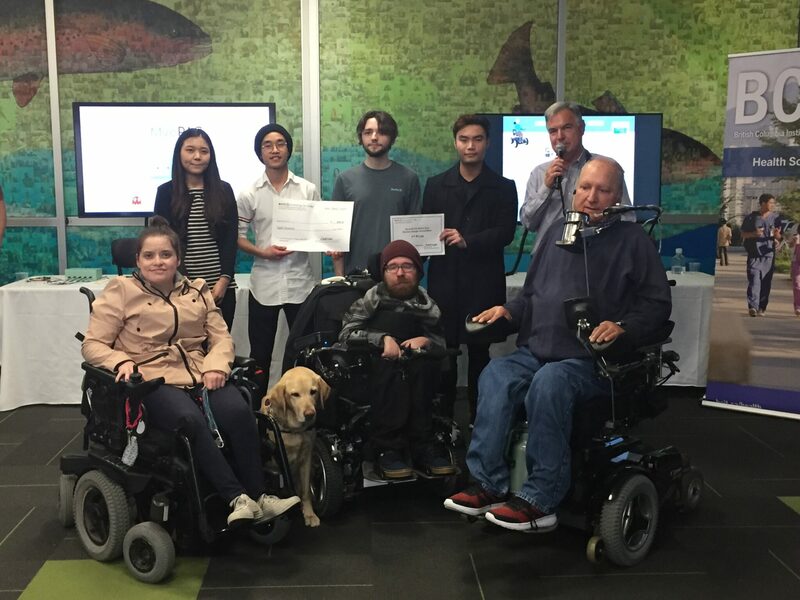 Every year BCITS partners with the students at BCIT for our annual Simon Cox Student Design Competition, our Board are committed to growing this into a significant event and opening it up to our clients giving students the opportunity to work on real challenges. Every project was a success. The amount of work and creativity from the students was inspirational. Each project created devices that were practical for people who live independently in the community. The students’ work and effort was amazing. The venue was buzzing with activity as the students showcased their work. It was inspiring to see creative solutions and the development of devices for now and the future. This sound activated alarm system designed for ventilator dependent individuals with limited muscular movement. (Photo below of the winning team with the judges). This device is intended to be used for speech impaired individuals to interact with voice-activated home assistant devices (such as Alexa or Google Home). This device will measure maximum, average, and real-time forces that are required to rotate the steering wheel. We appreciation everyone who helped make this competition such a huge success. Thank you to our generous sponsors, the BC Rehab Foundation and the Kinsmen Foundation. Thanks also to all the BCIT profs, student participants, BCITS member participants, judges and spectators. It was wonderful to have so many of our peers watch the competition and express interest in working on projects with the student next year. We need to gather your ideas before September, if you want to get involved in next year’s competition please email us at info@bcits.org for more information. See you at next year’s Simon Cox Student Design Competition!